Automatic, single-head machine for direct pick-up of caps. Designed for an average output of up to 3,500 per hour applying aluminium roll-on caps with a sealing head. Feeding of the closures is via a cap sorter designed to suit the closure and speed of the machine, mounted either on the machine or on a separate, adjustable stand. 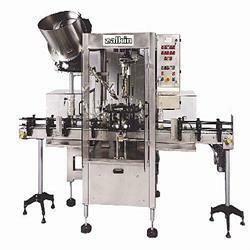 Bottles are fed via a slat chain conveyor that passes through the machine to the discharge.